Flashing brake light is now popular. The purpose of the flashing brake light is to make it more visible. Because the tail lamp (rear light) has the same red color as the brake light. Some manufacturers such as Mercedes Benz, Volvo, BMW, Honda have applied brake light that can flash on several models of car and motorbike. Read also simple adjustable twinkle light 2,200 watts. 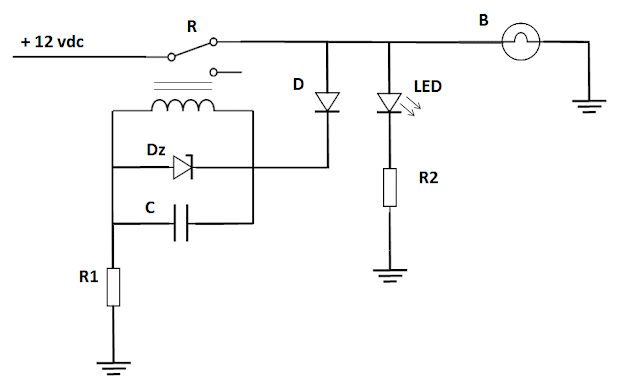 The following simple and inexpensive electronic flasher circuit can be used to make flashing brake light. It can be applied to LED light or incandescent bulb. The following photo shows the composition of the components attached to the matrix board. 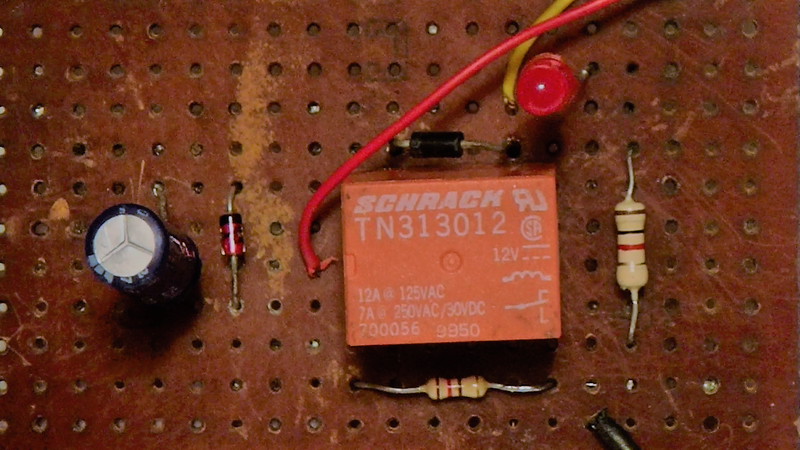 The following video on YouTube shows when the circuit prototype is being tested. R is a relay SPDT with five pins. SPDT stands for Single Pole Double Throw. Two pins of the relay are used to activate the solenoid, and three other pins as a switch. NC (Normally Closed) pins are connected when the relay is off, this pin is connected to the lamp and supplies current to the condenser (C). Flasher relay will turn on the light if the relay is not active. The relay will be active when the condenser is almost full. If the relay is active, the current to the lamp and condenser will be disconnected, because the relay connects to the Normally Open (NO) pin. The lamp will turn off. The condenser will supply the current to the relay solenoid, so the relay stays active for a while, and the lamp stays off. If the condenser voltage is low, the relay solenoid will off. Then the NC pin will be connected again, the light is on and the condenser is recharged. Then the cycle will continue. Seen in the circuit photo, 12 volt relay has orange color with Schrack brand type TN313012. This relay can transmit direct current for a maximum of 7 amperes. So for 12 volts the maximum power load, in this case the lamp, is = 12 x 7 = 84 watts. Condenser (C) determines the blinking frequency. With a value of 470 microfarads will make a blink with a frequency of about 5 hertzs, or 5 blinks per second, suitable for flashing brake light. The frequency will also depend on the relay which is used. With a value of 1,500 microfarads, flashing frequency is about 1.5 hertzs, suitable for turn signal (turn light). Because this flasher works with a solenoid (electromagnet), this flasher requires a negative wire. While the original flasher in a vehicle usually does not need a negative wire (ground), because it works based on heat due to the electric current that goes to the lamp. The original flasher is made of a bimetal that will disconnect the current when it is hot, and reconnect immediately after it's cooler. The turn signal lamp has a typical tick-tock sound due to the movement of the bimetal plate. The zener diode (Dz) stabilizes the voltage at 12 volts. Because the voltage on a vehicle is usually unstable, and causes flashing frequency change. Zener and condenser also eliminate high voltage (spikes) that is produced in relay's solenoid when the relay is turned off. The spike voltage can damage the transistor and IC. Zener or condenser must always be installed when the relay is activated using an adapter with a transistor or IC voltage stabilizer. Pay attention to the above schematic and picture, zener is installed in reverse position. The cathode pin is connected to positive and the anode pin is connected to negative or ground. The current will flow from the cathode (K) to the anode (A) if the zener voltage is exceeded. This is why the zener to be used as a voltage stabilizer. Resistor 1 (R1) connects the condenser (C) to negative (ground) when condenser is charging. The bigger resistant, the longer charging time for condenser, and the longer the lamp lights up. Conversely, if R1 is reduced, the length of time that the lamp lights up will be shorter. The current that passes through R1 also flows through the relay and activates the relay. If the R1 is too big then the relay will not be activated, because the current is too weak. Even though the condenser is full. From the test result, the biggest value of R1 is around 180 ohms, with this value the relay has begun to be difficult to activate. The diode (D) prevents the current from the condenser to flow into the bulb (B) when the relay is activated. The current from the condenser can only go to the relay solenoid, in order to control relay activation. LED light with a diameter of 5 mm is just an indicator, can be ignored. LED colors may be chosen according to your design. 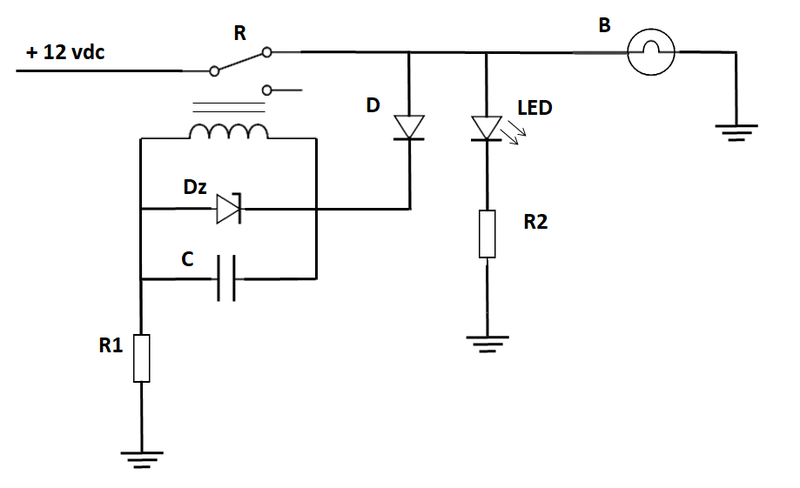 Resistor LED (R2) to limit the current so that the LED will not damage. This resistor can be ignored if the LED is not installed. If the resistant is reduced then the LED will be brighter. For a diameter of 5 mm, usually the LED current must not exceed 20 milliamperes. Lamp (B) is the vehicle's original brake light. Can be an incandescent lamp (bulb), or LED (Light Emitting Diode) light. In my opinion, the flashing brake light should not be used on the brake light that are adjacent to the turn signal. Because it can be ambiguous when viewed at a glance by other drivers at high speed. The best position for the flashing brake light is on the third (3rd) brake light, or the brake light in the center at the back of the car. Some motorbikes have turn signal light with stem and separated from the brake light, so it can prevent confusion if the brake light is blinking. Hopefully the reader applies this circuit wisely.